I had my doubts about this cake. First of all, it is not chocolate so that fact puts it at an immediate disadvantage in my book. 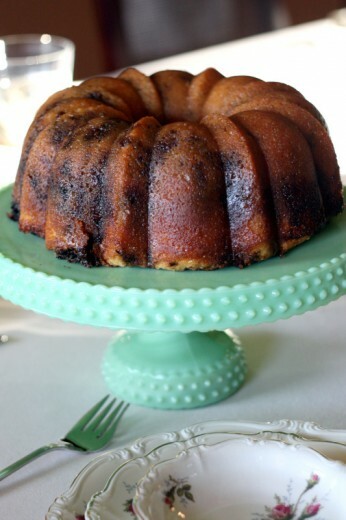 Second, it is a bundt cake and sometimes I feel like all bundt cakes taste the same – no matter what is in them. Third, it has molasses in it which made it smell kind of burned when it came out of the oven, and the glaze has a lot of butter in it which made it seem kind of greasy. But I was truly surprised by how much I liked it. Bundt cakes are nice because they feed a lot of people and they keep for at least a day or two wrapped well on the counter. They also freeze well which makes me forgive the fact that many of them taste pretty darn bland. So why is this one good? Oh, I don’t know. Lots of butter and sugar. Lots of bourbon and vanilla. And it turns out that molasses, while it doesn’t smell all that good – tastes pretty yummy. I hate to admit it but the pecans, usually a deal-breaker for me in desserts, added a lot here. A necessary crunch and a momentary distraction from the boozy flavor. Now that I am officially in love with my ice cream maker, I almost always make an ice cream to accompany my dinner party desserts. This time, I thought that the cake and glaze were quite sweet so some unsweetened whipped cream would be a better partner. I was right. Truthfully, I’m still on the fence about the glaze. I loved it brushed over the cake, but serving it alongside the cake it was a little, well, buttery. I’d make the same cake and tweak the glaze next time – more caramel-like perhaps. But I’d keep the bourbon for sure. I love that in typing out this recipe, I realize I did something wrong when I made the cake. The recipe tells you to mix the pecan filling into half of the cake batter. I just layered the pecan filling in between the two layers of batter so I got a more distinct, and powerful, dose of molasses and nuts. It worked well, but I’ll give you the original instructions here. Preheat the oven to 350ºF. Spray 10-inch (12 cup) Bundt pan with non-stick spray; dust with flour. Sift 3¼ cups flour, baking powder, and salt into a medium bowl. Using electric mixer, beat sugar, butter, and 2 teaspoons vanilla in large bowl until fluffy. Beat in eggs 1 at a time. Beat in flour mixture in 3 additions, alternating with milk in 2 additions. Transfer half of batter to prepared pan. Stir pecans, corn syrup, molasses and 2 teaspoons vanilla in another medium bowl to blend. Stir in baking soda. Stir pecan mixture into remaining cake batter in bowl. Spoon pecan batter over batter in pan (do not swirl). Bake until tester inserted near center of cake come out with dry crumbs attached, about 45 minutes. Transfer cake in pan to rack. Meanwhile, prepare the glaze. Stir 2 teaspoons water and baking soda in small bowl to dissolve baking soda. Bring sugar, buttermilk, butter, and corn syrup to boil in a heavy 6-quart saucepan over high heat, stirring to dissolve sugar and melt butter. Reduce heat to medium-high. Stir in baking soda mixture (glaze will bubble). Boil until sauce is golden and slightly thickened, stirring often, about 8 minutes. Remove from heat. Stir in bourbon and vanilla. Invert warm cake onto platter. 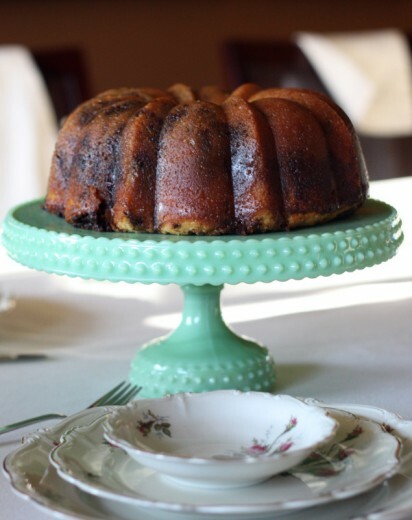 Immediately brush 1½ cups hot glaze over cake, allowing glaze to soak into cake. Cool cake completely. (Can be made 1 day ahead. Cover and let stand at room temperature. 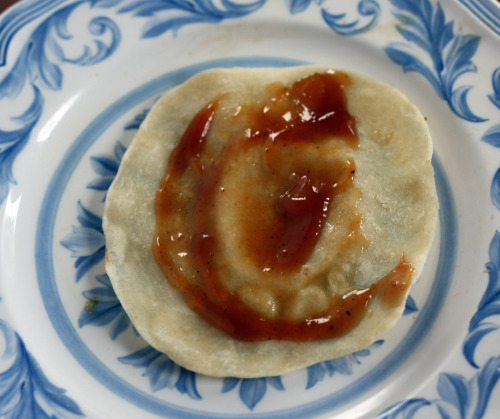 Cover and refrigerate remaining glaze.) Rewarm remaining glaze, stirring. Serve cake with whipped cream and warm glaze. There were others – dressing up like Attila the Hun and being chased by Kiss, the band, were my favorites. I was amazed by how many people dream about losing their teeth. I sometimes dream that I am chewing an enormous piece of gum and am trying to talk to someone and the gum keeps getting stuck in my teeth. When I go to take it out, it just pulls into long strands and keeps sticking. Anyway. Thank you again for sharing. I was so touched that many of you who usually lurk came forward and commented. As usual, I wish I could send each and every one of you this prize package. Because I like to give and because I have two children who were fighting over the task of picking a number out of a hat, and because I need an excuse to go back to Theo Chocolates (again, for the children! ), I had assistant #2 pick out another winner. I will send that person some chocolate goodies. Drum roll please. Winner #2 is Holly E (comment #18) who has this dream: “My anxiety dreams are always about high school. Often I am just roaming the halls or hiding out because I don’t remember what class I am supposed to be in. Sometimes I show up for the final after skipping the class all semester. Every now and then I can’t remember my gym locker combination. I keep hoping that one of these days I will “graduate” to college dreams! My FAVORITE dreams, however, are about the ocean: surfing, swimming, sometimes stuck under water but I can still breathe. I wake up feeling so ivigorated! 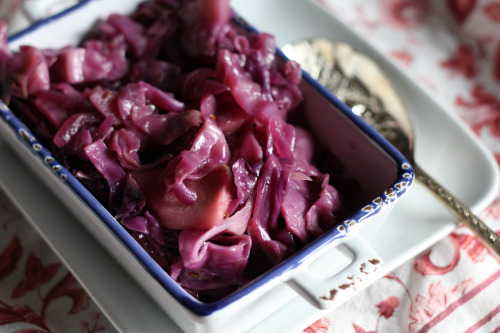 So let’s talk about cabbage. My darling husband thinks he doesn’t like cabbage. I mention it and he makes a face. This from the man who loves sauerkraut and coleslaw. 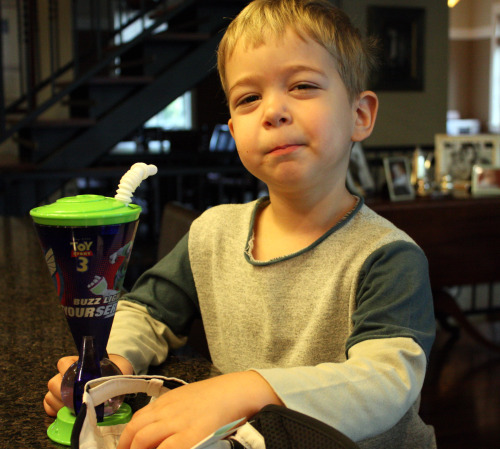 When I tell him that both those things are in fact cabbage, he just smiles and nods. 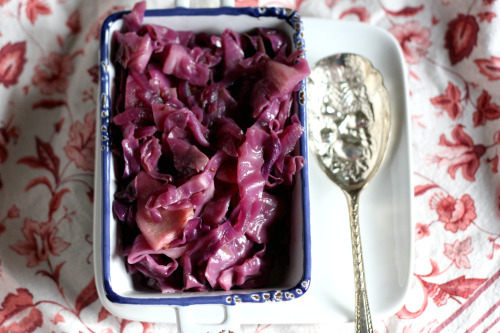 So I didn’t talk about the exquisitely purple cabbage I picked up at the farmer’s market and I didn’t tell him that I was going to use it in a side dish for a weeknight Dana Meal. I knew he would question a cabbage dish but I also knew he would love it once he tasted it. Which of course, he did. 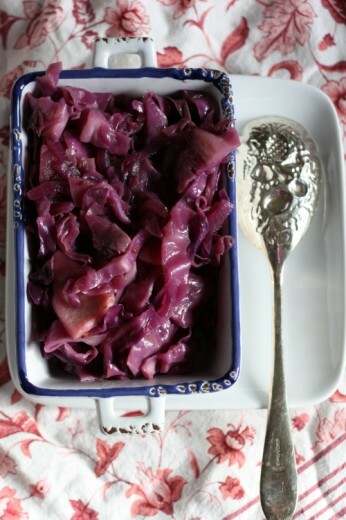 A beautiful cabbage thinly sliced. Peeled farm fresh apples too. A bit of sugar, salt, caraway seeds, and cider vinegar and then a good long simmer on the stove – this is a lovely dish indeed. The equinox has passed and fall is officially here. I have found this dish works well alongside so many different things during this season. This time I served it with a hearty pasta dish featuring buckwheat groats and a savory gravy (don’t knock it ’til you’ve tried it), but I have also served it with savory grain cakes sitting atop a carrot ginger sauce. I would imagine it would be magnificent alongside some kind of savory stuffed squash as well. Randy’s family serves sauerkraut at Thanksgiving (I know!) so he always requests that I make it for him. I’m kind of hoping I can talk him into this dish instead. He wouldn’t be the only one eating it, unlike the sauerkraut. I like this dish with a hint of sweetness so the seasoning here is perfect for me. I would imagine that you could replace half the water with apple juice or cider if you want it sweeter. In a wide heavy sauté pan over medium heat, melt the butter. Add the onions, brown sugar, caraway seeds, salt, and a few grinds of pepper. Sauté, stirring occasionally, for 5 to 7 minutes, until softened. Add the water, vinegar, cabbage, and apple. Raise the heat and bring to a boil. Cover, reduce the heat to low, and braise for 25 to 30 minutes. Uncover and cook over high heat for a few minutes until the juices have reduced. Season to taste with salt and pepper. Randy is usually the pancake maker in our house. Breakfast is not my thing and pancakes certainly are not the food I would choose to eat for that first meal of the day. My husband and boys are definitely not in agreement with me on this issue. And so, Saturday mornings, Daddy often makes pancakes. He uses Bisquick and I stay out of the way. Last week we were out of Bisquick (the horror! 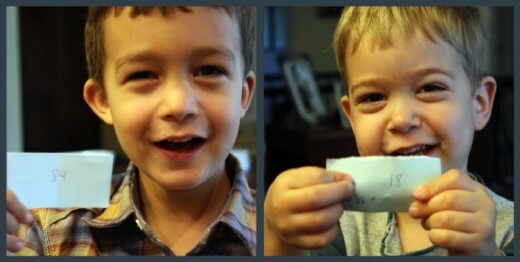 ), but the boys had been promised pancakes. If you have young children, you know you cannot promise something and not deliver. Especially if it involves pancakes. It does not go well. So, out came my copy of the The Joy of Cooking, which I keep on the heavy rotation shelf for just such occasions. While looking in the index, a totally different recipe caught my eye. 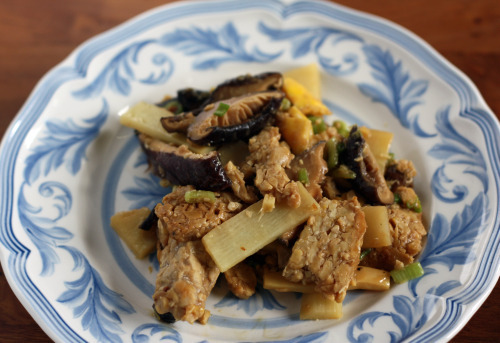 I loved moo shu pork as a child – why not moo shu tempeh? Oh, and make my own pancakes? Sure, why not! 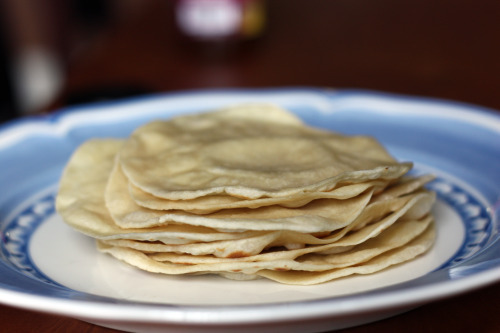 When Graham came home from school the day I made these, he walked in the house, sniffed, and asked, “What is that smell?” Thinking on my feet, I told him I was making tofu tacos. Did he want to taste one? He proceeded to eat three for a snack, three for dinner, and two for lunch the next day. Randy and I each got to taste one and then had to use tortillas as a wrapper fill-in. Those worked well and the size made this more of a main course so if you want to skip making the pancakes, you have my blessing. (Although they are really easy and satisfying to make.) You will most likely have some filling leftover – it tastes great over rice. You still have a couple of days to enter to win some great swag! Check it out here. Stir water and flour together until crumbly. Shape into a ball and knead on a lightly floured surface until the dough is very smooth, about 10 minutes. Let stand, covered, for 30 minutes. Divide the dough into 12 equal pieces. Roll each piece into a ball and then into a 3-inch disk. Brush the top of 1 disk lightly with sesame oil. Top with a second disk. 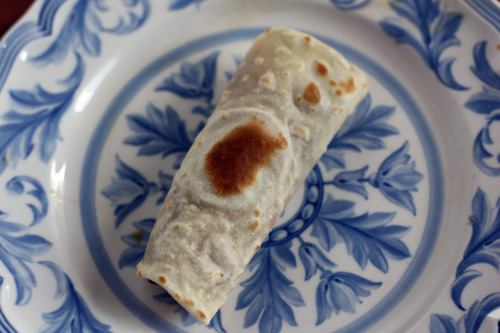 Roll out both disks together into a 6-inch pancake, being careful not to wrinkle the dough when rolling. Cook the pancakes in a lightly greased skillet over medium to medium-high heat until the surface blisters and turns the color of parchment; turn often with tongs. Remove from the skillet and immediately separate the pancakes. Repeat with the remaining disks. Keep the pancakes warm, loosely covered, in a 200ºF oven. At this point, the pancakes can be wrapped well and stored in the refrigerator or freezer. To reheat, arrange the pancakes slightly overlapping on a baking sheet and bake, covered, at 300ºF until warm, 10 to 15 minutes. Combine the water and mushrooms and let stand for 20 minutes, or until soft. Drain, reserving the liquid, and squeeze out the extra water from the mushrooms. Slice the mushrooms, discarding the tough centers and stems. Sprinkle 1 tablespoon of soy sauce over the tempeh strips. Heat a wok or large skillet over medium heat. Add about 1 teaspoon of sesame oil. Add the eggs and cook without stirring, until they are set but still moist. Remove the egg pancake and cut into small pieces. Heat another teaspoon of oil in the wok or skillet and add the tempeh. Stir-fry until lightly browned, about 10 minutes. Add the mushrooms along with the bamboo shoots, scallions, and ginger. Stir-fry for 2 to 3 minutes. Carefully pour in the mushroom soaking liquid into a small bowl, making sure not to allow the grit from the mushrooms go into the bowl. Add the remaining 3 tablespoons of soy sauce, the sherry, cornstarch, and sugar and mix together well. Pour into the wok and boil, stirring, until thickened, about 1 minute. Gently stir in the egg pieces. 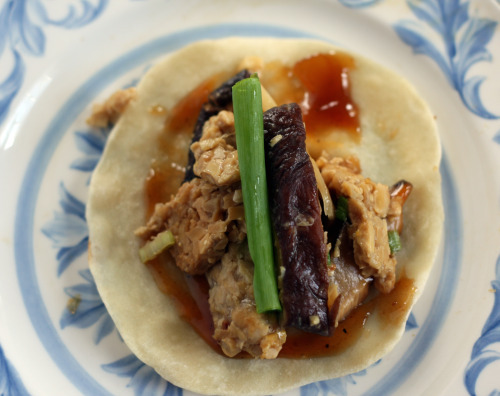 Spread each pancake with a bit of plum sauce and spoon on about ¼ cup of the tempeh mixture. Don’t overfill or the pancake will be hard to roll. Roll up and eat! The truth is that I’m happy about 400. I’m happy that 400 times I have sat down at our computer, looked out the window as I pondered what to write, winced as I went through my photos, and smiled as I hit publish. It’s pretty cool having a blog. And I want to thank you for reading. I’m feeling a lot of abundance in my life these days. Fall is here. It is my favorite season because of sweaters, boots, fires in the fireplace, lots of soup, and squash and chanterelles. We have two great trips coming up in the next two months. Thanksgiving is on the horizon and we have a new big table around which to gather our friends and family. My boys are in more school than ever before which leaves me a little more breathing room and time for myself. I have happy healthy people surrounding me and more wonderful friends than I ever could have hoped for. I am surrounded by cookbooks that make me happy and all kinds of kitchen gear which makes my cooking life easier. Speaking of which, you all know we got swag bags at the IFBC conference, right? I know so many of you wanted to come to that conference and could not for a variety of reasons. There were things in that bag that I either did not want or could not use. The five people staying with me also had things that they did not want or could not use and therefore, I have approximately an IFBC swag bag’s worth of goodies that I would like to send to someone. 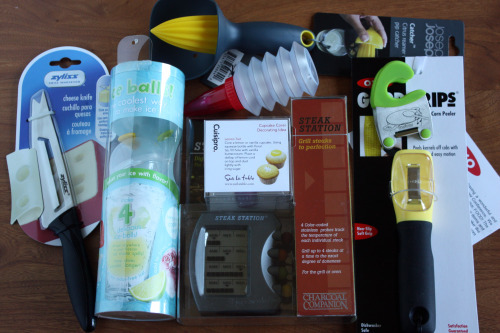 In addition to tools I didn’t need (meat thermometer anyone? 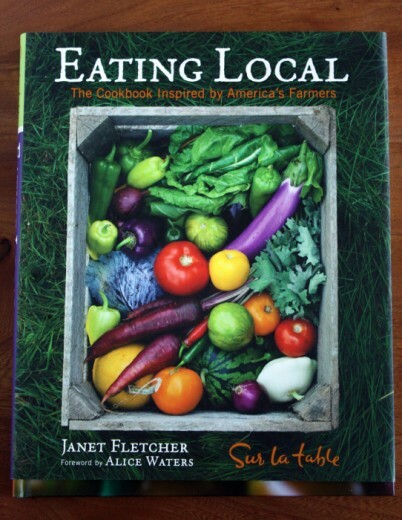 ), I am throwing in my copy of the lovely Sur la Table cookbook that was arguably the best thing in the bag. Why? Aren’t there recipes that I could use in there? Of course. But I’m sure one of you needs it more than I do. And since I just happened to re-visit the chocolate factory where the conference was held (for the children! ), I bought a little extra for the giveaway. Now. I am not an anxious person. In fact, I am a pretty relaxed person. These dreams crack me up. I find it interesting that I have never had a mom anxiety dream nor a cooking one – the two things that define me most. I’m not going to read into what you tell me – I’m just curious. Leave me a comment and one of my trusty assistants will pick a random winner. Thank you for reading. Sincerely. UPDATE: This has been fascinating reading so far! I will keep the giveaway open until Saturday, September 25th at 12 noon PDT. Thank you! UPDATE #2: Thanks to everyone who commented. The giveaway is now closed. I will announce a winner on Monday! This is the cake that first made me afraid to make layer cakes. This is the cake that showed me, in my early baking days, that something can turn out ugly and still taste delicious. This is the cake that taught me the meaning and importance of a crumb coat. This is the cake where I learned you can alter directions in a recipe and not get struck by lightning. This is also the chocolate cake that has been written about by approximately 1 million food bloggers. 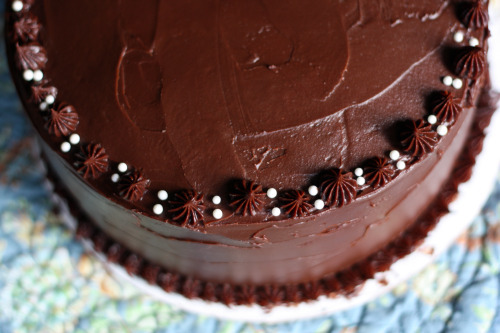 It is the cake that, at current count, has 1390 reviews and a four fork rating on Epicurious. This is the cake I decided to make when our friend Tim invited us to his birthday party and requested a chocolate cake, the richer the better. It was not an easy decision. 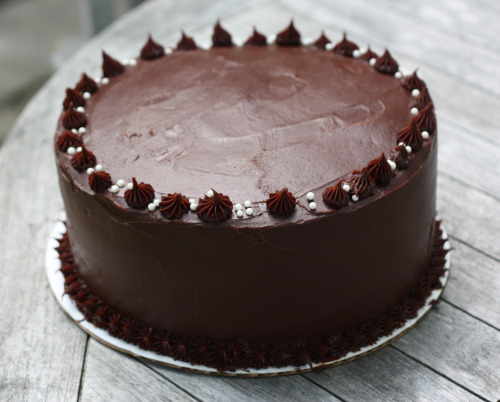 Between my cookbooks and notebooks with magazine cut-outs, I probably have a hundred chocolate cake recipes. I have my favorites. There are a few that I made long ago and want to try again (Mocha Ricotta Torte). There are some that I have never made because they scare me a bit (Chocolate Viennese Cake). But all of those cakes involved something fancy and not-chocolate component. The message I got from Tim was that he wanted pure chocolate. Normally in that case, I would make some kind of flourless chocolate torte. If just he and his partner were coming for dinner, I would have made this amazing cake called La Bete Noire (black beast). It is about as rich as they come. But this was a larger party and called for a larger cake, something with icing and layers, and could be used as a vehicle for candles and a round of “Happy Birthday” (except I forgot the candles). I looked around a little, knowing all the while I would come back to this cake. I did hesitate a bit. The original recipe tells you to make two 10-inch cakes. If you have successfully made this cake following those directions, can you tell me how you maneuvered said cakes into place? They are super moist and quite crumbly and I found trying to get them off cooling racks and onto cardboard rounds and stacking them one on top of the other resulted in broken cakes (hence the ugly but delicious). Somewhere along the way in my baking career, I decided to bake the cakes in three 9-inch pans rather than the 10′s and that works a lot better (hence the learning to alter directions). It also results in a taller more impressive looking cake. Now. After all that, all the times I have made it and tried to love it (the header in the recipe says the cake made the Gourmet editors swoon for pete’s sake), I am done with this cake. There are cake people and there are frosting people and there, of course, are both. I am a cake person. I can take or leave frosting. 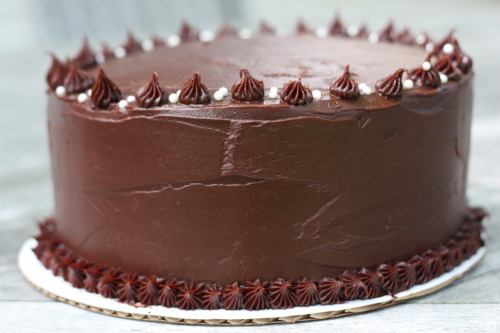 If the cake part is nothing special, I don’t care how beautiful the finished product is or how many pounds of chocolate there are in the frosting. This cake part of this cake is not for me. It is very moist but it is also too airy for my taste – too many crumbs (hence the necessity for a crumb coat). I like something denser. This cake has no butter in it – the fat comes from oil and buttermilk and I guess that just doesn’t do it for me. But. It’s a classic. It is an easy cake. It can be made in advance. And it looks pretty darn good too, don’t you think? The birthday boy was happy and that is the most important thing after all. When it is time to frost the cake, I find it is best to do the crumb coat while the frosting is a bit runnier than you want. 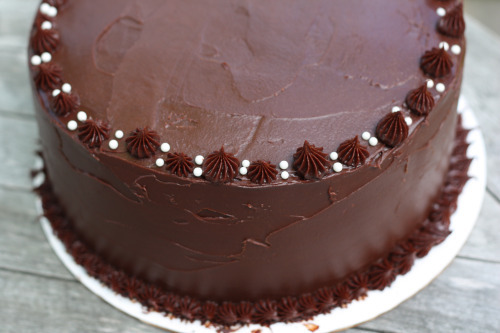 In the time that the crumb coat sets in the refrigerator, the rest of the frosting will come to the right consistency. Preheat oven to 300ºF. Grease three 9-inch cake pans. Line bottoms with parchment paper rounds. Finely chop chocolate and combine in a bowl with the hot coffee. Let mixture stand, stirring occasionally, until chocolate is melted and mixture is smooth. Into a large bowl, sift together sugar, flour, cocoa powder, baking soda, baking powder, and salt. In another large bowl, with an electric mixer, beat eggs until thickened slightly and lemon colored (about 3 minutes with a standing mixer and 5 minutes by hand). Slowly add oil, buttermilk, vanilla, and melted chocolate mixture to eggs, beating to combine well. Add sugar mixture and beat on medium speed until just combined well. Divide batter between pans and bake in middle of oven until a tester inserted in center comes out clean, about 45 minutes. Finely chop chocolate. In a 2 quart saucepan, bring cream, sugar, and corn syrup to a boil over moderately low heat, whisking until sugar is dissolved. Remove pan from heat and add chocolate, whisking until chocolate is melted. Cut butter into pieces and add to frosting, whisking until smooth.